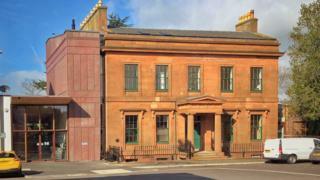 Scotland's national centre for children's literature in Dumfries will open its doors in June. It completes a multi-million pound transformation of the Moat Brae building where Peter Pan author JM Barrie used to play as a child. He credited that "enchanted land" as helping to inspire his most famous work. Moat Brae was on the brink of demolition a decade ago but now aims to become a major tourist attraction. It will officially open on 1 June following a number of preview events in May. It will employ 18 staff - 10 full-time - and is expected to attract 31,000 visitors a year, contributing an extra £1.3m to the local economy. Simon Davidson, Moat Brae's centre director, said: "We are looking forward to JM Barrie's birthday on 9 May and have a series of small preview events and other activities taking place throughout the month to test operations and make sure we can offer visitors the best possible experience. "This all builds up to June when we open to the public and begin the next chapter in the adventures in JM Barrie's 'enchanted land'." VisitScotland's regional leadership director Paula Ward said it could prove a major attraction. "The opening of Moat Brae will propel Dumfries and Galloway into the spotlight, sprinkling its magical fairy dust across the region and highlighting everything it has to offer," she said. "We hope that people young and old will feel inspired by the boy who never grew up and be transported back to childhood in a place where their imagination can run wild, drawing visitors from far and wide, growing the economy, creating jobs and sustaining communities. "From rich history and stunning landscapes, to epic adventures and exciting festivals and events, Dumfries and Galloway encapsulates all that is great about Scotland."